Arsenal executed a stunning gameplan to perfection as they outwitted a stunned Man City side by two goals at the Etihad Stadium. The Etihad Stadium was revved up in anticipation of a blockbuster match between two title contenders who undoubtedly looked to showcase a great match with plenty of attacking football. The hosts opened proceedings with a sharp start, provoking a foul from Koscielny and then booking after the Frenchman clumsily bumped over on a charging Fernandinho. City played advantage with Aguero loitering on the right but Pellegrini's star striker settled for a corner. Shortly following City's quick start, Arsenal began to settle down and implant their gameplan. A giant line of midfielders made it very difficult for Pellegrini's men to find a way through and set attacking minded players loose. Wenger must have been pleased with his side's start to the match. They made it tough work for City who not only couldn't break through, but their defence also had a big job to do with the danger of Sanchez lurking. The quality of Arsenal's defending told a whole story. It was fair to say Silva was held in Coquelin's back pocket, with even Sky Sports commentator Gary Neville suggesting a change in tactics with the Spaniard moving out wide. Courtesy of The Gunners' immaculate start, they claimed their reward which was a penalty; clumsily conceded by Kompany though. Monreal seeked a one-two sequence but prior to receiving the ball to run inside Hart's area, but City's captain stupendously nudged him over with a chest barge. Up stepped Santi Cazorla, and the Spaniard neatly tucked away past Hart in the right hand corner to ensure Arsenal's fantastic start reflected on the scoreline. City fans in attendance suddenly zipped up their usually vibrant voices after such a flat start against a superb Gunners side. Not one shot on target. A sense of urgency from City kicked in, and an immediate response was needed according to them. Navas scampered after a long ball and eventually launched in a couple of crosses that Arsenal did however deal with. It was a much better City side at this point, handed out warning signs to The Gunners. Kompany's dreadful first half following the conceded penalty was topped off with a booking after he frustratingly brought a charging Giroud down. Mike Dean signified the end to first half proceedings as Wenger's men lead an isolated City side by just the one goal that could well have been all they needed to hold on. Pellegrini had no choice but to change his shape. For the second half, Jovetic replaced Milner in order to get City back on level terms. Pellegrini's men looked much sharper and began to really test Arsenal on the flanks as Navas ignited lighting runs to catch the visitors out but Wenger's back line saw off to the danger. Maybe not convincingly, but they did their job. Ten minutes following the break, both sides committed to attacking play with fantastic, nail-biting end-to-end football. City were unable to draw level, but Arsenal's attempt to double their lead failed with tight back lines thwarting strikers. 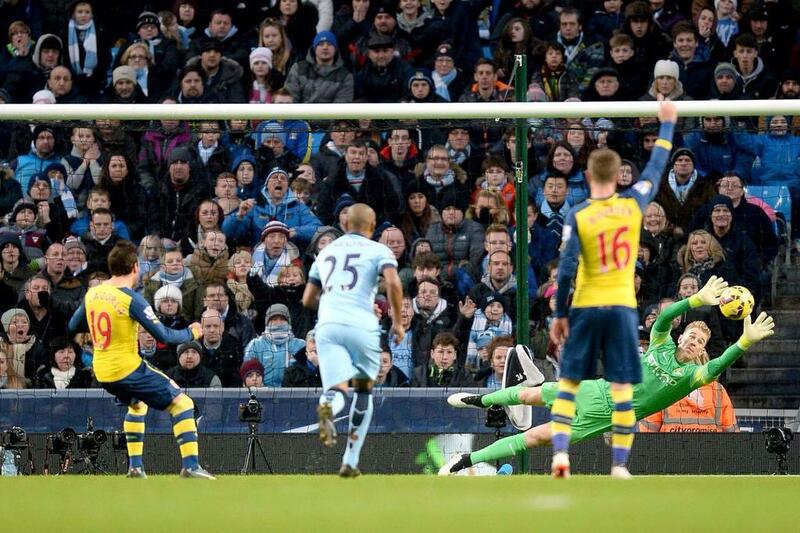 City's evening got a whole lot worse when Giroud doubled Arsenal's lead. Cazorla whipped in a free kick from 40 yards, and the Frenchman peeled away from a napping Fernandinho to fire a header straight past Hart in goal. Really poor defending, Giroud was just allowed to breeze onto the ball, which was top draw though. The hosts began to grow in frustration that signified when Navas, in a good position, but the Spaniard's shot blootered straight at Ospina whom had to do just about naff all during proceedings. Absolutely superb performance from Cazorla, he did his defensive duties plus attacking ones. The Spaniard displayed several tricks such as flicks, tricks and nutmegs. Just adds to his game. Chances in the second fell for City but their attacking firepower weren't on the ball. Perhaps due to Arsenal's tight, screw locked back line but nevertheless. During the dying stages, Flamini popped up on the right, toddled past Clichy and whipped in a low cross for Giroud but a vital touch on the ball ensured the danger cleared for that time being. Nothing came of the corner afterwards. The final whistle sounded to a ludicrous, drowned reaction from City fans but a vibrant one for relived but also ecstatic Gunners fan who had witnessed an almost immaculate performance from their beloved side. This loss for Pellegrini's men will be hard to take considering they had tons more possession and carried such a good record at home. Arsene Wenger, though, came up with a perfect plan and his players executed it beautifully. Modric bringing Magic back to England?